L’Estrade is no more than a couple of farmhouses, a barn and some other motley outbuildings. The farmer has a table laid out with urns of coffee, tea and orange juice for passing peregrinos. I am enjoying a coffee and a rest, rubbing my aching feet when this crowd of school children from Brittany appear with their schoolteacher and I became the subject of their lesson for the day. Where do I come from? Where am I going? Am I walking alone? Am I scared? Why am I rubbing my feet? They are on a week’s school trip and are walking 80km of the Camino. When they learn I am walking all 1600km from Le Puy to Santiago on my own they give me an enthusiastic round of applause, which make me feel like I am on stage. I am also the reason, they are informed by their teacher, that they need to learn English, as there are many people like me who do not speak French. 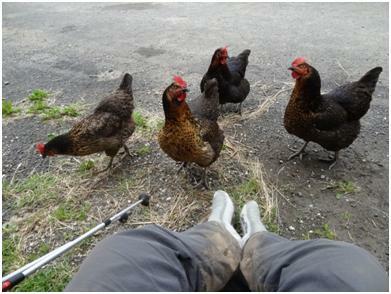 My next audience are a little more interested in my lunch.